1.The sequence of combing: from the neck, from front to back, from top to bottom in order, that is, from the neck to the shoulder, and then in turn back, chest, waist, abdomen, hindquarters, then comb the head, after Limbs and tails, comb one side and comb the other side. 2.The method of combing: Combing hair should be quickly combed in the direction of the hair. Be gentle. When combing a long-haired dog, it is necessary to comb it layer-by-layer, that is, to turn up the long hairs, and then comb their undercoats. 3.Easy combing of messy and bonded hair, removing dead hair from deep and superficial hair, stimulating hair follicles, promoting hair health, and beautifying hair. 2.Please combing the hair follow the growth direction. 3.Extreme pressure of the comb will lead to skin inflammation . If you are not satisfied with our products, please email us before leaving a negative feedback, we will make you the full refund or send you a replacement immediately, thank you for your support. Use a round head stainless steel needle to comb your pets. Stainless steel needles give your pets hair care. At the same time, they can massage the pet's skin, help massage your cats and dogs, remove loose hair, and Eliminate tangles, knots, dander, and trapped dirt. A vent hole is designed on the circular brush head to keep the pin's flexibility and better shape the pet's body and curves. The brush head adopts airbag design and uses elastic buffer to relieve stress. The pet also enjoys the beauty massage you give it. 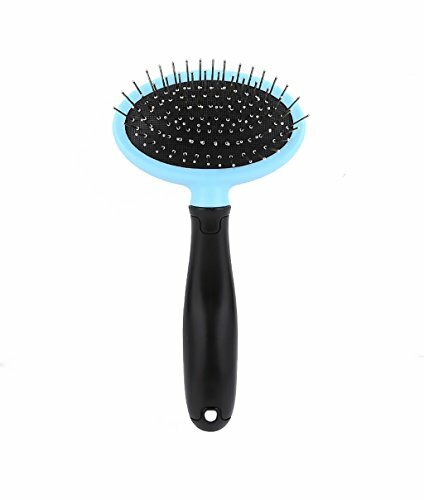 Beauty massage comb can make your pet hair shine and eliminate floating hair. Ergonomic non-slip handle, plus a unique design of convenient hanging hole, the use of environmentally friendly materials handle area, will not cause human or pet skin allergies. If you have any questions about this product by HaiMeiRui, contact us by completing and submitting the form below. If you are looking for a specif part number, please include it with your message.